I have been wearing glasses for about 39 years…yeah a long time. I’m nearsighted, which means I can’t see clearly objects that are at a distance. In the past 4-5 years, I was having to take my glasses off so I could read or do close up work. In the last year of so, I started not being able to see clearly, objects that were a little less than arm’s length away with my glasses on. 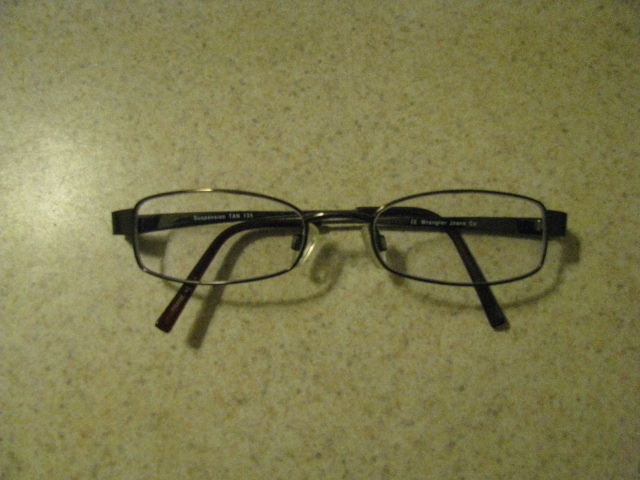 The problem with my old glasses was that the entire lenses were for distance vision. So, it was time to do something. The type of lenses I have been wearing for almost 20 years are the ultra light weight lenses and the Transitions lenses for the past 5 years. If you are not familiar, with those they are the lenses that get darker when they are exposed to sunlight and lighten back up to a clear lense when back indoors. They are also lighter weight and thinner than regular plastic lenses. This is an important feature for me because 1)I am outdoors a bit and it really is a hassle to carry two pair of glasses especially if I’m working in my garden or taking a walk or something like that and 2) It’s hot as you know what here in the summer. These lenses are not cheap but when ya can’t see what’s a girl gonna do?! Now couple that with having to get a bi-focal or really a tri-focal and the price tag is higher than my monthly mortgage payment ($414) was when I had one of those thangs. No exaggeration or said for drama…yep, higher! Dang it!!! That’s not what I really wanted to say but I know some of y’all that read are Christians so I’ll try to keep it clean. 😉 What I’ve got are the Progressive lenses. These are the no-line bifocals. Call me vain, but I’m only 45 and it’s bad enough that I’ve got to have bi-focals. I’m not ready for lines in my glasses yet…maybe in 20 years but not now! Translation…cha-ching! Yeah, I said that already! Mine are really tri-focals because there are 3 different strengths of vision in the lenses and in my case it’s really only 2. My farsightedness which is where I can’t read/see objects close up, is where I don’t have it because I can see/read perfectly clear without glasses. Whereas most folks like DH have to have reading glasses in order to read or say thread a needle. So, the top of my glasses is for distance like before. The middle is for seeing at half arm’s distance away, like for computer work etc. and the very bottom has no prescription at all so that I can see/read as if I’m not wearing my glasses. Is it worth the price? Yeah, it is, because I can see no matter the distance with my glasses on. Surprisingly, the adjustment period was very short. I guess because I was already having to move my head and eyes above my glasses to see close up. I also got the kind that gives a wider field of vision thru the lenses. Of course that added to the price tag, but still worth it. I’m wearing my glasses right now as I type this post and can look out the window across the street at the neighbors house. I was not able to do that before with my glasses on. don't be ashamed! My friends has had bifocals since high school! You just do what you have to do, and I would say good glasses is a very worthwhile investment! Wow, that's expensive!!!!!! My mom wears two pairs because of this very reason. One is a pair of bifocals. On behalf of other Christians,thanks for the language, tee hee. Hey Sis! Oh I got over being ashamed a long time ago once I was able to get frames that I liked on me. You are right…gotta do what you gotta do. Thanks for stopping by! Yeah Sis, like I said, it's expensive to be blind. lol These lenses for some reason do not get quite as dark as my old pair. ( I usually always have a spare pair…not this time though) Thank goodness my distance vision has not changed so I'm still using my 10 year old pair of prescription sunglasses for intense sunlight and driving. See I can rant a bit and keep it clean. lol Thanks for stopping by! Expensive is right. I wear glasses as well. I have a seriously strong prescription so I have to pay for the lighter lens as well. Especially if I get wire frames…because those things wouldn't hold in the metal frames. I think that it's far better to see than not to see! So get your tri focal on…I think being able to see is always in style~!! lol….did I mention that I agree CHA-CHING~! I must be in the wrong field of business!